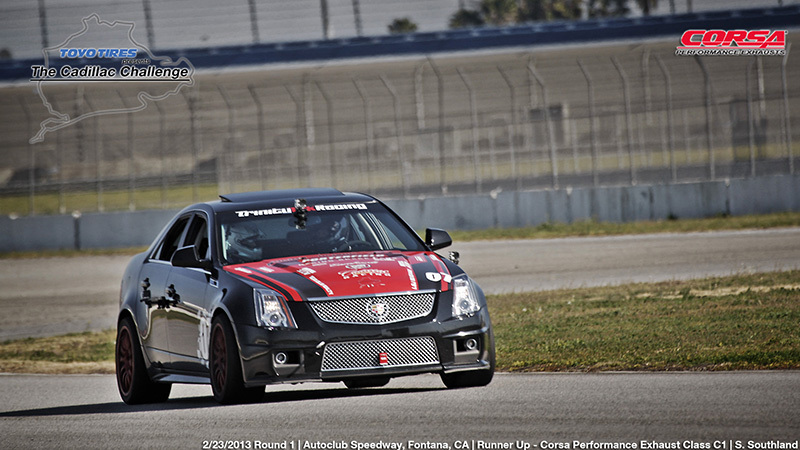 This article is courtesy of D3 Cadillac and CadillacRace.com for Round 1 of the 2013 Cadillac Challenge Presented by Toyo Tires Winners. 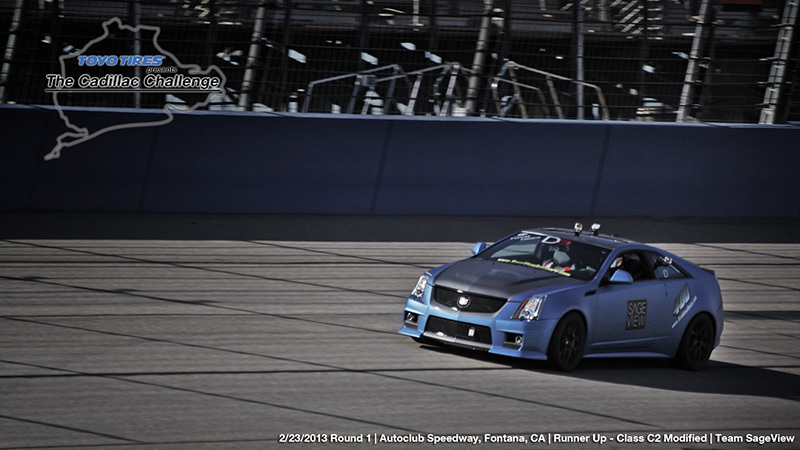 Be sure to keep up with all of the latest from the 2013 Season at CadillacRace.com and keep it tuned here for all of the results! Fontana, CA February 23rd, 2013. Today was significant because it marked the return of the Cadillac Challenge presented by Toyo Tires for the 2013 season. The highly competitive 2012 season exceeded expectations throughout with the excitement escalating as the season went on. The burning offseason question was whether the series would sustain and build upon that momentum in its sophomore season. The sophomore season brings a few changes to the Cadillac Challenge. Changes were made to the vehicle classification process whereas teams and drivers now accumulate a bank of points that allows them a to make some mid-season upgrades without incurring a heavy penalty. The Showroom Stock class has been introduced that caters to those looking to participate without extensive vehicle modifications. In total there are now (4) classes for the various Cadillac vehicle offerings. The idea was to level the playing field and allow CTS and ATS vehicles into the Challenge and be competitive. The new Showroom Stock Class had a couple of late entries. 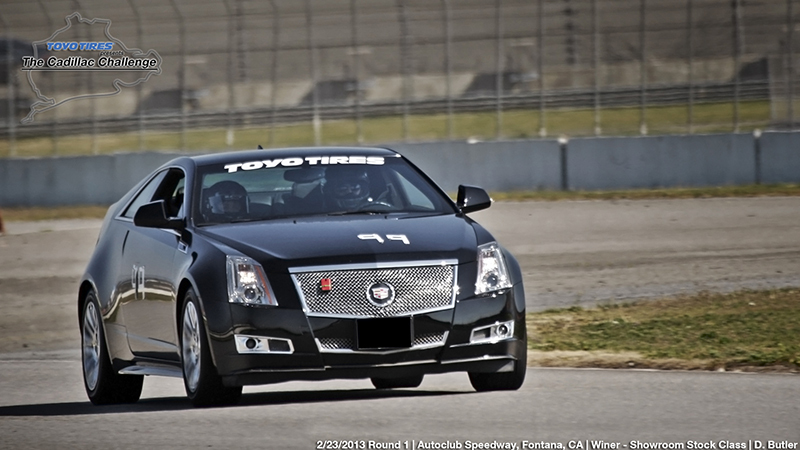 Don Butler and his 2012 Cadillac CTS Coupe were ready to tackle the Auto Club Speedway’s 2.8 mile ROVAL. All day long he worked on line and technique, shaving many seconds off his early efforts to post a best lap time of 2:22 to win the newest class. The late entries of Mike M(?). and Ed Wagner, and their ATS vehicles showed that they will be a force in the future events. They both posted practice times, but did not log competition times eligible for the Challenge. The Corsa Performance Exhaust Class C1 was enjoying the fruits of their newest class sponsor Corsa Performance Exhaust. Returning 2012 C-1 Class Champion Steve Collins and his F22 Matte Black CTS-V Coupe came in fresh from the offseason with the single-minded intention to repeat as Corsa Performance Exhaust Class C1 Champion. However standing in his way would be a couple of new drivers and teams. With the series adding Corsa Performance to the mix, the ante has been raised for the 2013 season. Competitors came from all over to not only try and knock off the reigning champion, but to lay claim to the Corsa Performance Exhaust Class C1 victory and its attendant spoils. The paddock was full of excitement. Newcomer to the series, but not new to motorsports, Team Trinity Tek Racing was looking to impress fresh off the trailer from Arizona. With steering wheel in hand, driver Sean Southland, had to learn the track quickly. Being that this was the team’s first trip to Fontana’s ROVAL track in competition, the learning curve was as steep as Turn 1’s banking. Fresh onto the track Southland turned a 2:08.439 lap time in the opening session. Returning Cadillac Challenge participant, Brian Navis was back in his beautiful thunder grey CTS-V Coupe looking to turn a few competitive laps. Navis would manage to post a best lap time of 2:14.791. Matt Martin and his CTS-V Sedan came off last season gaining serious momentum. Expectations were high for Martin, intent with challenging the reigning class champion to the limit, he aggressively opened qualifying sessions. Unfortunately a mechanical failure retired him from competition very early in the day. Collins and his CTS-V Coupe established the pace, opening the first session with a 2:00.745 lap time. With that serving as the standard the competitors went to work making adjustments to tire pressures and braking points. Sean S responded with a 2:00.189 lap time that certainly put some pressure on Team F22. In the end, the returning Champion was too much for the field; Collins held his cool and posted a new track record of 1:57.564 for a Corsa Performance Exhaust Class C1 vehicle. This solidified his victory for the event and put him in the early points lead. Class C2, Modified. This class always delivers fierce back and forth competition. Likens to a great middleweight fight, this class has big power & agility. Noticeable by their absence was WPA Motorsports and 2012 Cadillac Challenge C2 Champion Richard Caleel. With his offseason modification work spilling into the fresh season, we would have to wait for the debut of the returning C2 champion. 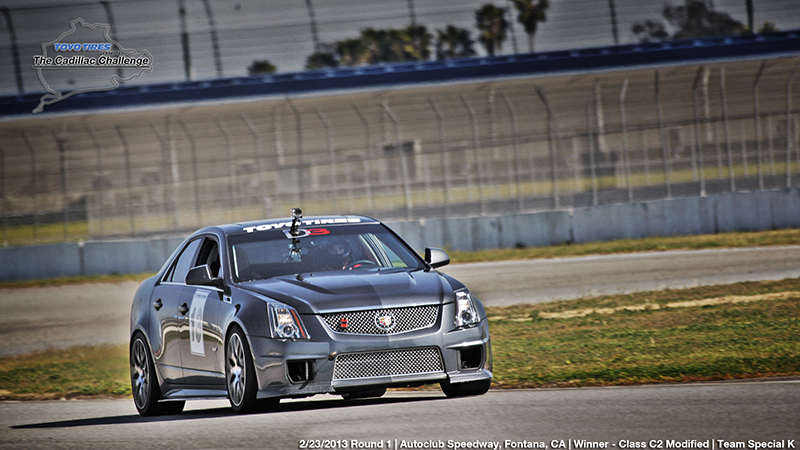 Moving into the C2 class was Sam Lollar and his monster-horsepower CTS-V silver sedan. With offseason moves looking to make his car more consistent on the racetrack, he was looking to see how the improvements translated to track time. He opened the session with a couple of hot laps, but ran into technical difficulties with his new setup and reluctantly retired from the competition. He wasn’t the only silver sedan in the field this day. One of them belonged to Hector Lantin and his road ready CTS-V Sedan. Determined to build on his experience last season, he consistently increased his pace throughout the day. Ultimately he ended up with a best lap time of 2:01.200. Would it be enough to take top honors for the day in the one of the most competitive classes the Cadillac Challenge series has to offer? Not if Series veterans Karim Tarazi of Team Special K and Edward Wagner of SageView Racing had anything to say about it. SageView’s coupe sported an all new Blue finish on his CTS-V Coupe. Whereas Team Special K made their offseason adjustments under the panels. The morning session for C2 started back and forth. With Tarazi jumping out of the gate quickly posting a smoking 1:55.841 lap time, Wagner knew what he had to do. Opening his morning qualifying laps, he posted a 1:57.307 lap time. Knowing that there was time to be found in his setup, Wagner quickly went back to make a few adjustments in the hope of shaving seconds. Team Special K was not one to rest on that lap time and also made changes in an effort to bring lap times down. As the afternoon wore on, both drivers were shaving time off of their day’s best. After the dust settled there could only be one victor. And today that victor was Karim Tarazi of Team Special K with a new personal best lap time of 1:54.307. Ed W of SageView Racing was outpaced by just 1 second finishing with a best lap of 1:55.374. Let’s see what this means in a couple of weeks with reigning champion Richard Caleel of WPA Motorsports is back in the fold. Either way, if the first race is any indication of how the rest of the season will be, this will once again be the class to watch for the closest competition the Cadillac Challenge has to offer. Finally in the Unlimited Class, or better known as Class C3 we saw the no-holds- barred, run-whatcha-brung class. If you can think it up or use it on your racecar, it’s legal. The opening round had familiar faces for sure. All the way from New York, Team CTS-V Racing was back with the Patriot Missile and driver Alan Cohen. Alan has been very busy since we last saw him. Cohen and his team have become quite accomplished on the East Coast. He is the current and reigning TTU NASA-NE Champion and is considered the fastest production based CTS-V on the east coast. Those accolades do not come easy and without merit. Looking to go toe to toe with the other C3 competitors, Team CTS-V Racing went to work to shake down the car. The first shake down run clocked Cohen at a 1:58.992 lap time. Everyone already knew what kind of pace the car was capable of and it was only a matter of time until the full potential of the car was revealed. Returning C3 Champion, Bob Michaels of Team HeaVyweight Racing was back with some fresh offseason work. 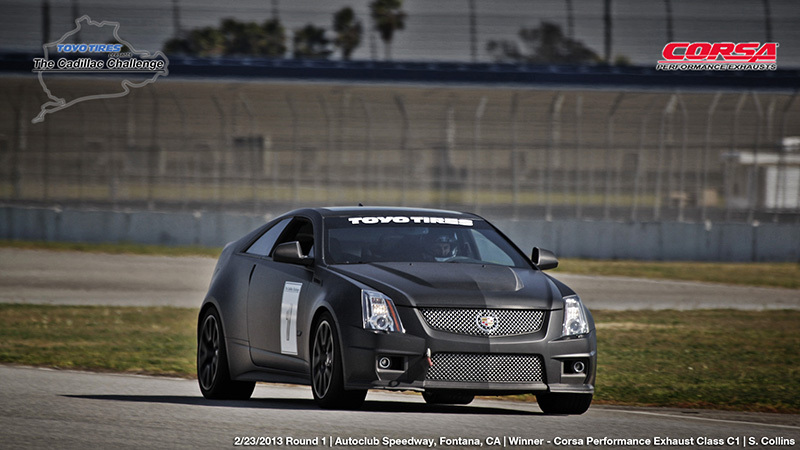 Looking to defend his title as the fastest production-based CTS-V Michaels wasted no time. Fresh off the trailer Team HeaVyweight Racing laid down a jaw-dropping 1:53.967 lap time. Facing that kind of fierce competition, Alan knew he would have to increase his pace. Not to be outdone, James Gill driver of the Team D3 Legionnaire CTS-V Coupe was back. This team is always developing new products with which they hit the track in the morning session. Gill’s first couple of laps showed that their pace would be in the mix with Michaels and Cohen. However before the first session was over, Team D3 Legionnaire laid down a simply ridiculous 1:51.330 lap time. Obviously that didn’t go unnoticed even though it was only a qualifying run. Cohen and Michaels went back on track looking to officially register their competitive lap times. First up was Cohen and his silver Patriot Missile. Sporting new aero treatments to keep his vehicle stable at high speeds, he laid down a lap time of 1:55.672. Unfortunately for Team CTS-V Racing, mechanical difficulties set in, retiring Cohen early from the competition. Undeterred, he was heard all over pit row, “I’ll be at Chuckwalla! I’m looking forward to competing for the class victory.” Team HeaVyweight Racing and their matte black sedan slipped on some fresh Toyo RS1 slicks looking to make an improvement on their previous qualifying sessions. With the new shoes and a sense of purpose, Michaels squeezed off a 1:52.571 lap time. Would it be enough to secure the victory for the day? James Gill of Team D3 set out to try and best that time. Could he repeat his amazing lap time from the qualifying sessions? The Legionnaire Coupe pushed its Toyo R-888’s to the adhesion limit in an effort to best Michaels’ time. When the clock stopped the time read 1:52.118. Victory and early points lead go to James Gill of Team D3, narrowly beating Michaels by .4 of a second. As the Cadillac Challenge presented by Toyo Tires opens this new chapter in its book, there is no doubt that this Series is the real deal. With cars being fielded from around the country to showroom stock cars competing with other stock cars, it has everything. Cadillac has created a foundation in their vehicles to allow the Cadillac Challenge to tap into the cult like following the brand has created over the last 10 years. These track events have helped people experience their vehicles in ways that one would never know on the streets or highways legally. There were over 20 Cadillacs and their drivers in the paddock, some competing, some just watching the action, but all having a great time. Be sure to check back as the Cadillac Challenge presented by Toyo Tires will tackle the Chuckwalla Valley Raceway March 24th, 2013. Also visit www.cadillacrace.com for a full schedule of the series for the duration of the year. Happy motoring. 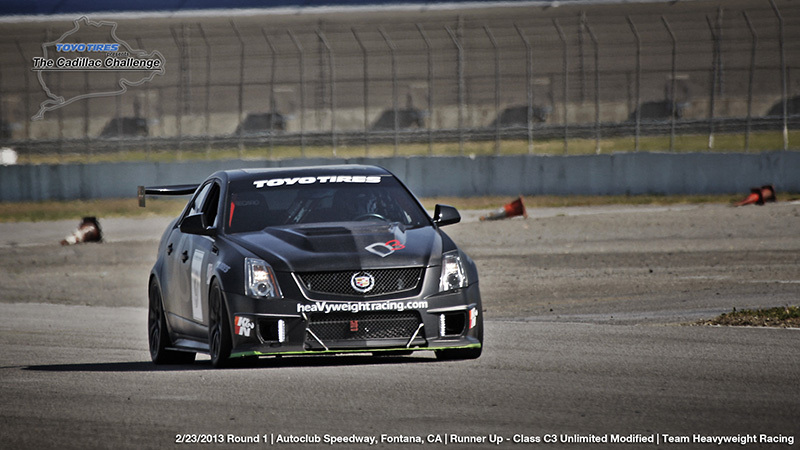 Rd1 of the Cadillac Challenge presented by Toyo Tires took place on Sat 2/23/13 at Autoclub Speedway, Fontana CA. 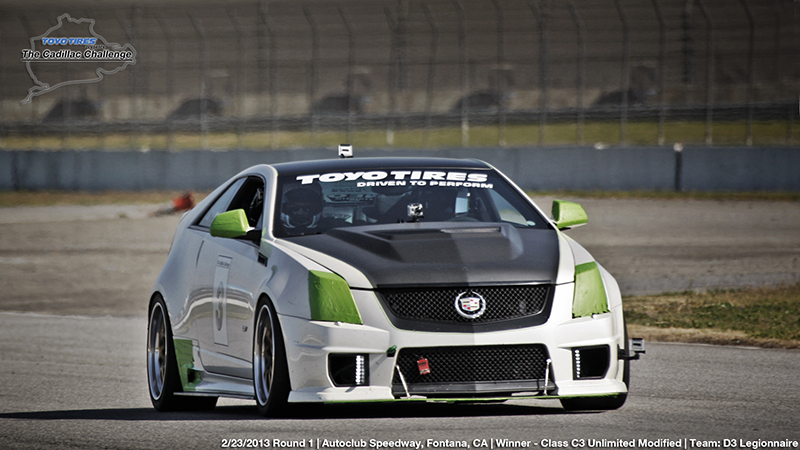 What team are you rooting for in the 2013 Cadillac Challenge presented by Toyo Tires Winners? Leave a comment and let us know!